He is not only defending Assad, he's also preserving his own power. Dictators have never looked so good. 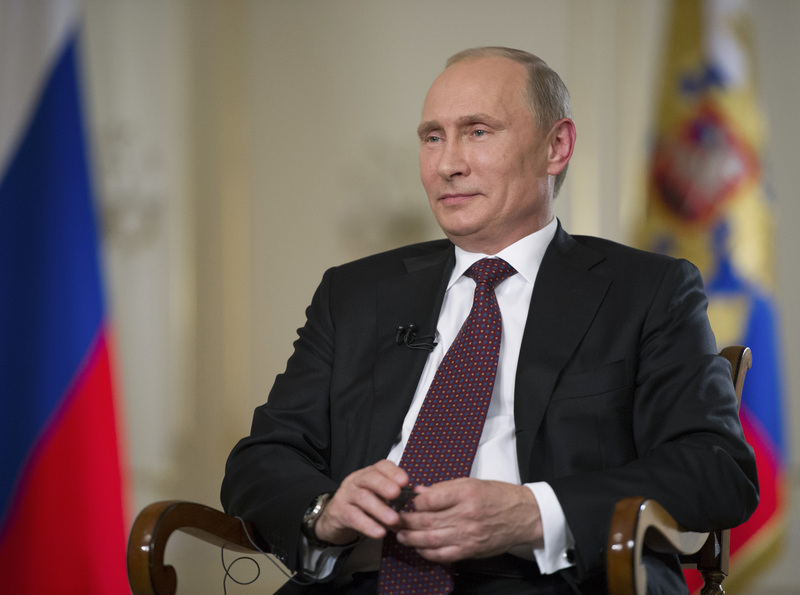 Vladimir Putin is saving the United States from another Mideast military intervention. Bashar al-Assad promises to 'thin the herd' of jihadists and hold Syria together. And Egypt's new strongman, General Abdal Fattah el Sisi, says he is sorting out the Muslim Brotherhood. With each passing month in the Middle East, it seems, authoritarianism grows more attractive. Leaders described as "repressive" sound eminently reasonable. They promise to bring order to chaos without dirtying American hands. Putin's op-ed article in the New York Times on Wednesday was the latest example. Written with the help of the American public relations firm Ketchum, the piece provoked a dizzying array of reactions. Here's one fact check by Max Fisher of the Washington Post. Here's a take down from Human Rights Watch. And the New Yorker posted this hilarious Andy Borowitz mock Modern Love column by the macho former KGB officer. The views Putin expresses are seductive. Some of his criticisms of American power are legitimate. American unilateralism -- from Iraq to drone strikes to National Security Agency surveillance -- undermines President Barack Obama's credibility on striking Syria. But in the end Putin's opinion piece matches his Russia. It is appealing on the surface but hollow at its core. Throughout, Putin lies by omission. In other spots, he lies flat-out. Here are two examples that would make Orwell proud. Putin presents himself as the pacifist and Obama as the militarist. He argues that American cruise missile strikes will "result in more innocent victims" and that the U.S. increasingly relies "solely on brute force." He makes no mention of the vast amount of weaponry Russia has shipped to Assad over the last two years. Or the 2008 military incursion Russia carried out into Georgia without the approval of the UN Security Council. The Russian president then portrays the entire Syrian opposition as jihadists. He says there are "few champions of democracy in Syria" and "more than enough Qaeda fighters and extremists of all stripes fighting the government." No mention is made of Assad's decision to fire on unarmed demonstrators when the uprising against him began. Nor does Putin say that government forces committed eight of the nine mass killings recently investigated by the United Nations. Finally, citing no evidence, he claims that "there is every reason to believe" that the rebels carried out the August 21st chemical attack outside Damascus. The issue, though, is not a tendentious op-ed. It is the state of Putin's Russia. While he declares himself a defender of "international law" in Syria, Putin's government systematically violates international law at home - from jailing political opponents, to imprisoning independent journalists to advocating laws that legalize homophobia. I briefly visited Moscow in May, while covering Secretary of State John Kerry's first trip to Russia. Western diplomats and Russian analysts painted a bleak portrait of Russia's future. In a globalized economy where innovation, foreign investment and transparency are key to growth, Putin is suffocating all three. Putin's relentless centralization of economic and political power has created a one-dimensional economy dependent on oil revenues. The random court cases brought against Putin rivals have prompted Russian and foreign investors to flee. They pulled $1.2 billion from Russia-focused equity funds this spring, Reuters reported, citing Putin's failure to enact long-promised economic reforms. In Egypt, there are clear parallels. Gen. Sisi is promising stability, playing on nationalist sentiment and crushing all potential rivals, from Islamists to liberals to journalists. Ursula Lindsey reported in the New York Times Thursday that an ultra-nationalist "cult of Sisi" is emerging in the country. "Of course, this obfuscates some uncomfortable facts," Lindsey wrote. "Having shaped the country's economy and politics for the last 60 years, [the Egyptian military] is one of the institutions most responsible for Egypt's corruption and decline." Signs are emerging that the brutal crackdown Sisi launched two months ago that killed 1,300 Muslim Brotherhood members may backfire. Last week, the country's pro-military interior minister narrowly survived a bomb attack. If elements of the group have radicalized, a full-scale insurgency could emerge in Egypt. Yes, Obama has waffled on both Egypt and Syria. He has repeatedly contradicted himself on national security. And the concept of "American exceptionalism" is clearly repugnant to other nations. But Putin's defense of Assad - one of the most cynical exercises in statecraft in decades -- does not make him a visionary. Nor does it make Russian-style authoritarianism a model for the Middle East. There is nothing complicated or altruistic about Putin's strategy in Syria. He is defending Assad in order to preserve his key ally in the Middle East and his own rule in Russia. Putin sees Syria as the latest in a long line of American interventions that has toppled rulers. Dismissing protests against himself and other autocrats as CIA plots, he probably fears he may be next. As 100,000 people have died, Putin has used obstruction at the United Nations -- not deft diplomacy -- to elevate his standing in the world. He has spread false conspiracy theories and glossed over Syrian government war crimes to again make Russia a player on the global stage. Difficult questions need to be asked about U.S. interests in the Middle East. Fostering thriving, stable democracies should be our objective. But quickly achieving that ideal is not possible. In each nation, different approaches are needed. The Arab Spring has shown that rushed transitions to democracy can devolve into chaos, where jihadists can thrive. But we should not be fooled into thinking that authoritarianism is a long-term answer to the complex dynamics roiling the Middle East. It creates stability in the short-term -- and stagnation and decay over time. The path to democracy in the region is long, complicated and deeply unnerving. But it should remain our ultimate goal. This article also appears at Reuters.com, an Atlantic partner site.